Parks Canada is seeking nominations for potential places to add to its impressive list of UNESCO World Heritage Sites. Here are five sites that were most recently added. Is there a place that you think embodies a facet of Canada’s natural or cultural heritage, but has not been recognized? Until January 27, 2017, you can nominate that place to become a UNESCO World Heritage Site. In August 2016 Parks Canada launched a public call for nominations to identify new places to add to Canada’s Tentative List of World Heritage Sites, which will be presented to UNESCO — the United Nations Educational, Scientific and Cultural Organization — for consideration. Read more about Parks Canada’s call for nominations and the tentative list advisory committee. To get you thinking about your UNESCO nominations, here are the five most recent sites that have gained World Heritage status and how Can Geo has celebrated them. Stretching 202 kilometres from Lake Ontario in Kingston to the Ottawa River in Ottawa, the Rideau Canal is considered the best-preserved example of a slack-water canal in North America. When it opened in 1832, a short time after the end of the War of 1812, the 24-lock engineering feat was to serve as a wartime supply route to the settlements in Upper Canada. It is also the only canal built during the 19th-century canal-building era that’s still operational along its original route. For these reasons, it was designated a UNESCO World Heritage Site in 2007. Read about writer Erin Anderssen’s trip down the Rideau Canal with her family. Rising more than 30 metres above Nova Scotia’s Chignecto Bay in the Bay of Fundy, the Joggins Fossil Cliffs hold the world’s most complete record of terrestrial life from the early Carboniferous Period, approximately 300 million years ago. The layered cliffs, once tropical wetlands located near the equator on the ancient continent of Gondwana, are continuously eroded by the highest tides in the world to expose approximately 200 fossilized species of plants and animals that helped shape our understanding of the evolution of life on Earth. The Joggins Fossil Cliffs were inscribed as a UNESCO Worled Heritage Site in 2008. The Landscape of Grand Pré comprises a 13-square kilometre swatch of flat farmland flanked by dykes located on the Bay of Fundy’s Minas Basin in Nova Scotia’s Annapolis Valley and is an important site of Acadian history. Starting in the early 1680s, Acadians settlers began transforming the salt-water soaked marsh into fertile farmland and built a community that existed in harmony with the local Mi’kmaq people. Starting in 1755, the Deportation of the Acadians, or the Grand Dérangement, forcibly expulsed the regions’ Acadian population. The area is a symbol of the triumphs and hardships faced by the Acadians and became a UNESCO World Heritage site in 2012. Learn more about Nova Scotia’s UNESCO World Heritage Sites, including Grand Pré and the Joggins Fossil Cliffs, in “Sea Change” by Lisa Gregoire published in the Summer 2013 issue of Canadian Geographic Travel. Red Bay, Labrador, located on the Strait of Belle Isle, is the site of the largest-known 16th-century Basque whaling station. From the 1540s to the early 1600s, thousands of whalers from the Basque region of southern France and northern Spain came to the port to hunt bowhead and North Atlantic right whales, harvest their oil and ship it back to Europe, where the important commodity was used in lamps and other items. Red Bay contains archeological remains of more than a dozen oil-processing stations, temporary dwellings, a cemetery, whalebones and several vessels submerged in the harbour. Red Bay Basque Whaling Station became a UNESCO World Heritage Site in 2013. Take a virtual tour of Red Bay and other Labrador towns through Google StreetView. 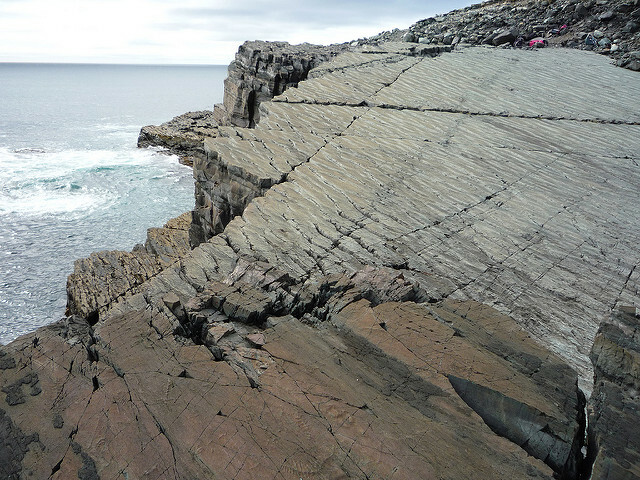 The fossils at Mistaken Point, a landscape of rocky cliffs and coastline on the southeastern tip of Newfoundland, mark an important milestone in Earth’s evolution: when life got big. The fossils at Mistaken Point depict the earliest large, biologically complex organisms, ranging from two centimeters to two metres in size, which inhabited the deep sea floor of an ancient ocean 572 to 542 million years ago during the Edicaran Period. Mistaken Point is the largest and most diverse collection of these fossils in the world and was named a UNESCO World Heritage Site in July 2016. Learn more about Mistaken Point here. Stay tuned for a list of six places currently on Canada’s Tentative List of World Heritage Sites that are awaiting UNESCO designations.